Successful basketball results from a combination of several skills, including speed, conditioning and athleticism. As a result, coaches and scouts test speed using a series of assessments such as the 40-yard dash, agility drills, vertical jump and the mile run. These assessments test your average speed, agility, power and endurance. The guards are the smallest and leanest players with the most speed and agility, while the centers are the largest players with the slowest times. The 40-yard dash is the most common speed assessment used in sports. It combines explosive speed used during the start along with absolute speed for running a fast time. An average college basketball player runs the 40-yard dash in about 4.81 seconds. The agility drill tests your ability to quickly accelerate and decelerate while changing directions. An average college basketball player performs the agility drill in about 8.95 seconds. The mile run tests overall conditioning, endurance and fitness levels. 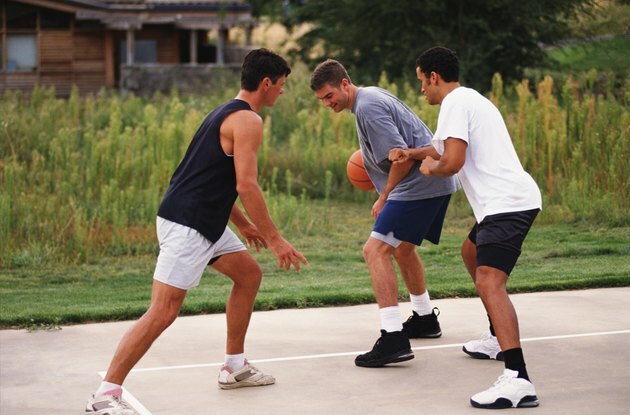 An average college basketball player completes the mile run in five minutes, 40 seconds. While most speed tests display horizontal displacement, the vertical jump test is used to display vertical speed and overall lower body power potential. An average college basketball player has a vertical jump of about 28 inches.